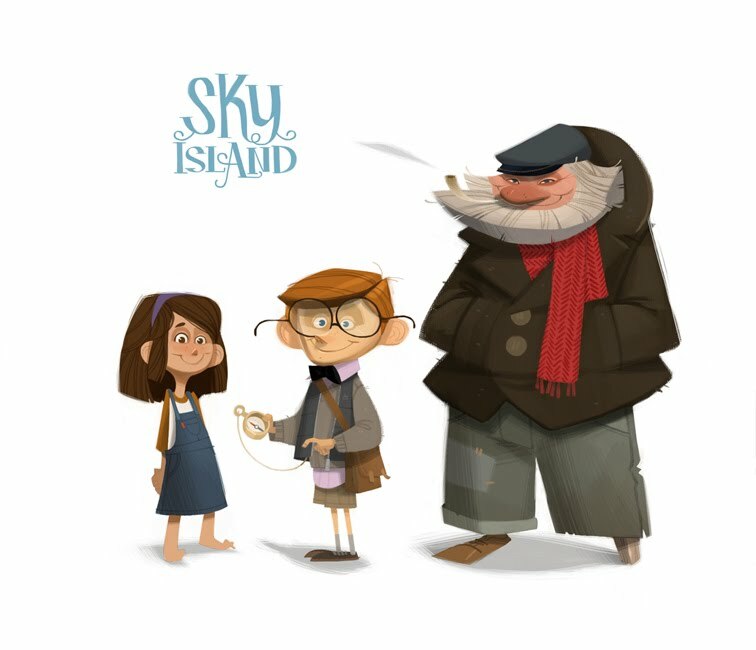 Above is my take on characters from Frank Baum's fantasy novel called 'Sky Island'. Like his Oz books the Sky Island world lends itself well to visual development. Doing characters in full color is a process I'm still developing and wanting to get better at... Below is a moment in the story where Button Bright is looking for his magical umbrella in the evil rulers treasure chamber, that of course is guarded by a blue wolf =] Hope you enjoy and please, any feedback is always welcome. Thanks. These are great! I especially like the design for Cap'n Bill. these are fantastic! love the colors...the blue wolf panel is so moody, brings you right into the story! the light on the tip of the wolf's nose is a great tough. good idea. Ageed the Chap'n Bill is awesome, the shape language around his beard and trousers is right on the moneymaker, with simple graphic shapes. Also like the subtle complentary colors in the treasure chamber Blue Wolf >< Button Bright. I always well up in awe of your work, Willie. Spectacular work! Also, I hope to see you again at this year's CTN! Wow. Totally speechless! Amazing inspiring work! keep fighting the good fight, Willie. It's great to hear that someone as talented as yourself is still on the hunt to improve. By the way, those characters rock. Heck yes!!! Those characters look great! So appealing. Look behind you Button! Never mind the magical bumbershoot get out of there! Color test successful. These designs are wonderful. Cap'n Bill is my hero! I am a student now taking Oliver's layout design. He often shows ur works to us as an great example, I am so attracted by ur line quality and creative layout drawing, ur diner posted at the second floor of Powell building is my favorite. may I ask, what kind of material u usually use? general 2B pencils or orange color pencils? I also impressed by ur skill of using colors. not like always blending colors very smoothy but u do have a clear shape of shadow. anyway, I love all the pieces in ur blog, all of them are well designed. awesome. Great designs. Really like the design of everything in the second one. the light on the wolf's snout is what did it for me. awesome piece! FARK! Willie, beautiful stuff man! I like your character designs, these characters need to be in a movie! ha, thanks bobby. miss you guys. thanks again for your wonderful feedback guys! Damn Willie! These are beautiful!! So so fantastic! Love the expressions! thx for sharing!